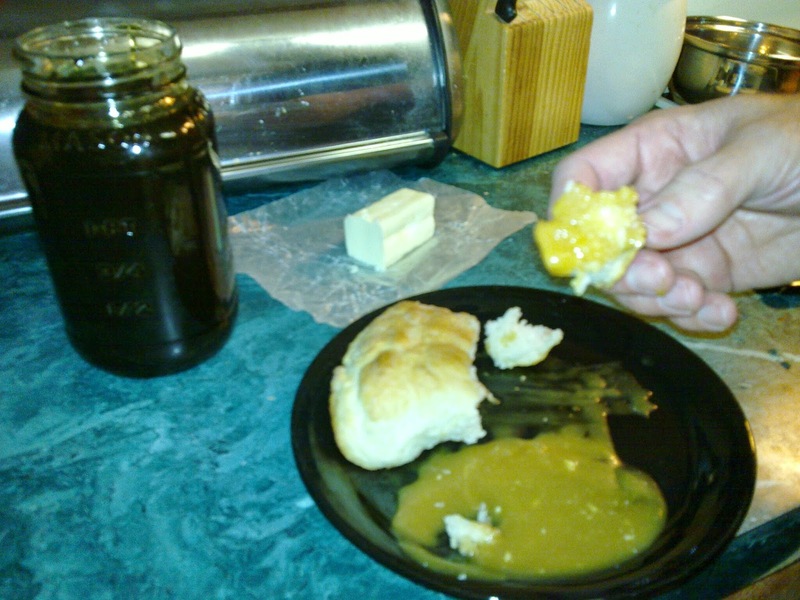 One of my favorite treats is home made honey butter. It’s better when made with buckwheat honey. It’s best when served with home made butter and biscuits. Here are some pics of me making honey butter. 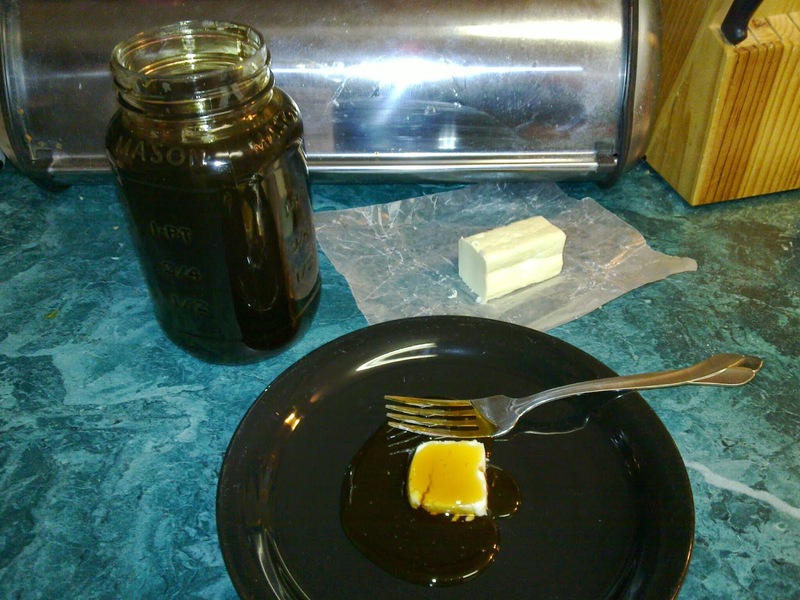 Cut a pad of butter and pour honey on top. 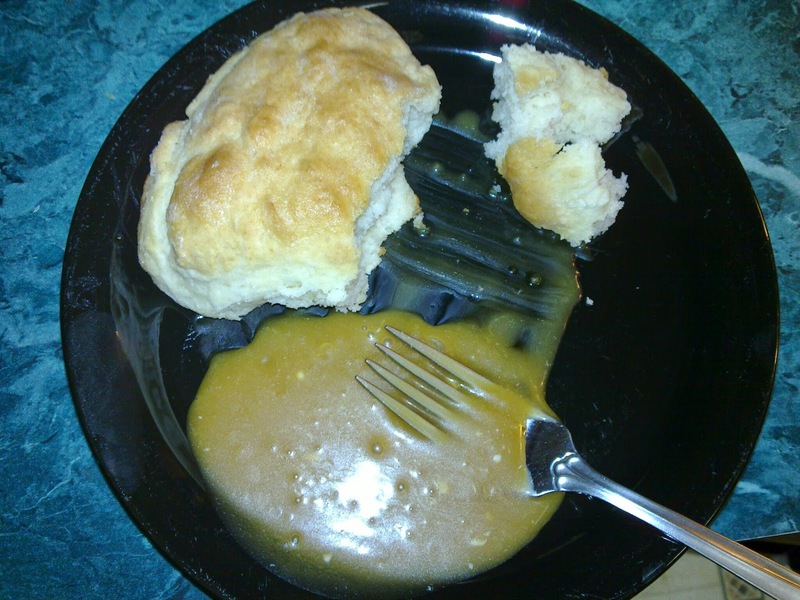 Mash the butter and honey together with a fork. Rip off a piece of the biscuit and dip in the honey butter, Eat and Enjoy!!! If you’ve never tried any of the darker honeys, I suggest you do. The flavor in a darker honey is out of this world. Much more complex than many of the lighter honeys I’ve tasted. When combined with butter, it’s causes a flavor explosion in my mouth. 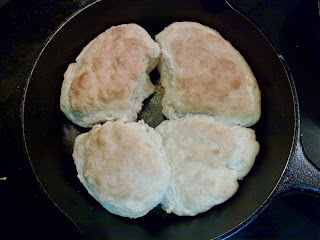 Writing this is making me want to ask my wife fix more biscuits. Mmmm, mmm. I recieved an email from the admin over at BeeSource explaining that a 13 year old Boy Scout named Christopher Stowell is seeking support in trying to convenience the Boy Scouts of America to reinstate the Beekeeping Merit Badge. This is important for our beloved hobby. An interest in beekeeping by young people helps spread the knowledge gained by older generation on to future generations, there by preserving valuable knowledge. As many of you reading this already know, beekeeping is a very rewarding hobby, and a source of income for a lot of beekeepers. I’ve not read this anywhere, but I suspect that the reason that the BSA stop the Beekeeping Merit Badge in the first place was over concerns of people allergic to bee stings having reactions. I can just imagine a concerned mother, of a son with allergies to bee stings, raising an issue to the point that the BSA just decided it was easier to not to have to deal with the potential liability. I suspect that this is the same reason that many cities have also banned the hobby, including NYC. Which I hear that they have now reascended, and it is once again legal to keep bees. The problem with banning beekeeping is that keeping bees is beneficial to our plants, many of which we depend on for our survival, and to our enjoyment. One of the reasons that I keep bees is they provide me with an unlimited amount of stimulation to my curiosity. I think I will never completely understand them. It’s interesting to read about a manipulation technique and the reported results, and then to reproduce those same results in one’s own bees. Why deprive people of such a rewarding experience? I understand the fear associated with the allergy. My Mom is deathly allergic to insect venom. Has been all of her life. But there are very effective mitigations against Anaphylaxis shock, where the body tries to fight the venom’s effects. I keep an epi pen on hand in case a visitor happens to have a reaction in the event of a sting. I reccommed that you do the same. How ever if one will keep in mind a few rules when around a hive of bees there is little chance of an issue. If you’d like to support Christopher Stowell in his effort to encourage the powers that be at the Boy Scouts of America then visit his beepetition and add your support. At the time of this writing it’s already 270 pages of comments. At 10 pledges per page he’s already got 2700 signatures of support. If you’re interested in offering your services as a mentor to anyone that will seek the Beekeeping Merit Badge you can do so at this thread over at Beesource. Or if you prefer you can download, print, and mail this pdf. And if you’re a member of a club you can help pass the resolution showing your support by downloading, printing, and mailing this pdf. One of the joys of beekeeping is sharing that joy. Let’s show our support of Christopher Stowell’s effort by signing his petition and offering to be a mentor. Many people, and I do mean many, are afraid of bees. Bees of all kinds, honeybees, carpenter bees, and bumblebees. I believe the reason for this fear is that honeybees in particular look very similar to yellow jackets. And many people, including yours truely, have had very unplesent experiences with the aggressive yellow jacket. In any case, I wanted to share some information that will hopefully help alleviate some anxiety over being around a colony of honeybees. honeybees, in general, are very calm and not very defensive. This is one of the reasons that man can keep bees. If they are too arrgessive, it would be more trouble than it’s worth. Such is not the case. Even though many beekeepers wear protective gear, there are probably just as many that don’t. The ones that do wear the protection because they are entering the brood chamber, where the babies are, and the bees can become a little defensive then. Smoke is the main tool of protection for a beekeeper. The smoke causes the bees to gorge only honey which makes them less aggrressive, and therefore less likely to sting. So enough of the descroptive paragraphs, lets get these rules of behavior around honeybees into a list. Never approach a hive of bees from the front. They perceve it as an attack and will retaliate. Always approch from the side or better yet the back. Wear light colors. White is the best color to wear. honeybees are aggitated by the color black. Keep pets out of the bee yard. In fact don’t pet your dog before going into the bees. The bees can smell it and they don’t like it. Stay calm. bees are like any other creature, they can sense and react to fear. DO NOT jar the hive. This includes not throwing things at the hive, knocking on the side of the hive or knocking it off it’s stand. Don’t make sudden movements. Honeybees will “jump” at you if you make sudden or quick movements. Don’t wear strong perfums or scents. Some cause the bee to think you’re a flower. Watch out for strong scented shampoos and conditioners too. Not a rule exactly, but this is very important to know and remember. bees only attack when they are defending their young, the brood. Singular bees out on flowers won’t usually attack. However, if you step on one, it may sting you. But a sting from a single bee isn’t the same as an attack. Yet, to the allergic, a single sting may be all it takes. There are anywhere from 40 - 100 deaths resulting annually from stings of bees, wasps, yellow jackets, and other stinging animals acrroding to page which is using the government statistics as their source. Similarly, if you see a swarm looking for a new home there is no reason to fear. It’s been observed by many experieced beekeepers that bees are the most docile when in a swarm. Again, there are 2 main reasons for this. 1) They consume as much honey as their bellys will hold before leaving the hive. 2) They have no brood to protect. When honeybees swarm they fill up on honey to prepare for the journey and the activity of building comb at their new home. All this requires energy, which the honey provieds. Since they have left the colony in search of a new home, they left all the soon to be hatched bees behind. Protecting the young is the main reason for defensivness. Without that motivation, an experienced beekeeper can scoop up a swarm of bees and not receive a sting. honeybees are some of the most gentle of the stinging insects. It’s a quality that forged the relationship between man and bee. Man has since breed his bees to be even more gentle. Still, they are wild creatures and can be provoked to sting. Bees are not looking for a reason to attack though. Keep the above list in mind when around honeybees and you’ll have a much more enjoyable experience. Who knows, you may even fall in love and become a beekeeper yourself.